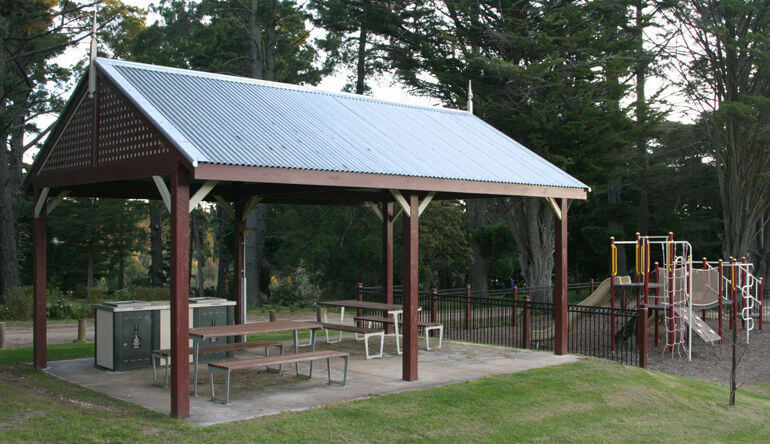 Playgrounds Picnics BBQs | Business & Tourism Creswick Inc. This playground celebrates Norman Lindsay's famous children's book The Magic Pudding, and includes a cubby house, swings, stepping stones, the Salt Junk Sarah boat and a sandpit. The playground is fully fenced. Business & Tourism Creswick Inc. is currently working with Hepburn Shire Council to upgrade and add more features to the playground. Albert Street (Midland Highway), Creswick, opposite the Visitor Information Centre. The Splash Park is operated by Hepburn Shire Council and the water equipment is open during the summer months. Other features include skate ramps, a climbing wall, a basketball/netball hoop, and outdoor gym equipment for adults. There are shade sails for shelter from the sun on hot days. Corner Bridge Street & Castlemaine Road (Midland Highway), Creswick. This is a fully equipped playground with newly installed equipment, and is located close to Park Lake. There are toilets nearby. The playground is not fenced. Situated alongside the Caravan Park in Cushing Avenue, only about 1 km from the Post Office, this venue offers excellent family friendly facilities, especially in summer with the popular water features including the diving platform as pictured below. There are three picturesque lakes that dominate this park. There is even a paddling pool for young children. The electric BBQ is free to use. Located off Bridge Street Creswick (250metres on the right side going up the hill), enter into the Mount Prospect Tennis Association grounds and follow the track around to the right hand side (20 metres) of the grass courts. The grass tennis courts make an excellent backdrop to this beautiful picnic spot. Note that Park Lake is situated around 100 metres to the south of the playground and picnic facilities, and can be accessed on foot down a fairly steep incline with two paths that contain rugged steps, or approached by road from the Castlemaine Road. Close by is the historic Park Lake Rotunda - an ideal undercover picnic spot for groups and families. A great picnic spot. Serene and peaceful. Two BBQ facilities and picnic benches. Great for swimming and fishing as well!